While the market's frenzied attention has lately shifted to the cracks appearing in the leveraged loan market, which as we reported last night is seeing the "wheels come off" following record outflows, a collapse in loan prices, massive original issue discounts, pulled deals, banks retaining loans on their books unable to find buyers and a general sense that the market is about to freeze, one should not forget the original bogeyman that many believe will be the cause of the next credit crisis when the upcoming recession finally hits: a wholesale downgrade of investment grade (or BBB) rated companies into the junk space as rating agencies finally wake up to the reality of what the combustible mix of record debt, declining cash flows and a contracting economy mean for US corporations. And it is here that things are once again moving from bad to worse. Recall that just two weeks ago we reported that no less than $90 billion in A-rated bonds had been downgraded to the lowest investment grade rating, BBB, below which companies become "fallen angels" as they move from investment grade to high yield, resulting in forced liquidations as countless vanilla funds are simply not permitted by their mandate to retain junk on their books. Fast forward to today when Goldman reports that just two weeks after our original report, the number of A to BBB downgrades has doubled to a whopping $176 billion in the fourth quarter, just shy of the all time high hit in Q4 2015, and with several more weeks still left this quarter, it is likely that a new downgrade record will soon be hit. As Goldman's Lotfi Karoui writes overnight, there are good and bad news in the recent data. The good news is that in the credit strategist's opinion, the downgrade risk is higher among A-rated issuers than it is among their BBB-rated peers. The bad news is that Goldman may have been "too" correct, as this view has continued to play out through 4Q2018, and "quarter to date, over $176 billion of debt has migrated into BBB territory from the A bucket; the highest amount since 4Q2015, which was a period characterized by a heavy wave of commodity-related "fallen angels". 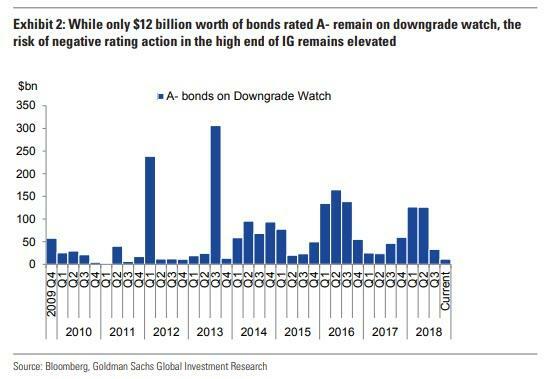 Meanwhile, as shown by Exhibit 2, $12 billion worth of bonds rated A- remain on downgrade watch, and while Goldman believes that this is a relatively modest number, "we think it is worth bearing in mind that downgrades can – and often do – occur when a rating has a stable outlook." Putting these trends in context, Goldman writes that over the long term, "we continue to believe the risk of negative rating action in the high end of IG remains elevated, more so than in the BBB bucket" and highlights one recent example from this week in which the announcement of a debt-funded share buyback – and the related deterioration in leverage – served as the catalyst for a downgrade into BBB territory. We do not view this as a unique example. As we discussed recently, the willingness of many highly-rated IG firms to utilize their ample debt capacity for maintaining (or increasing) shareholder returns and pursuing M&A opportunities in 2019 is strong. 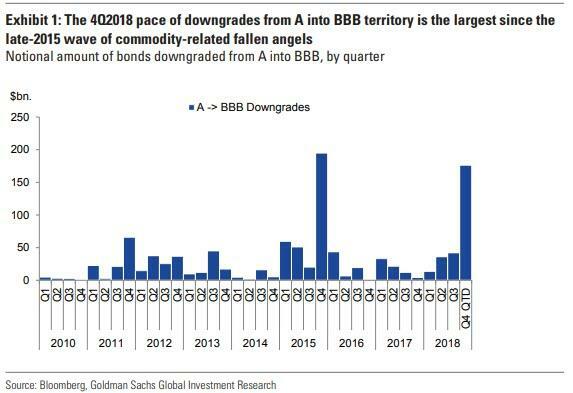 So yes, Goldman may be right, and it is likely that the even bigger risk of a "fallen angel" avalanche is the downgrade of A-rated names to BBB. But while rating agencies are clearly adding to the pre-fallen angel camp, there is no denying that the big threat is what happens if and when the BBB downgrade deluge begins. As Deutsche Bank calculated last month, when looking at those bonds most at risk of getting junked, $150bn of the $736bn of BBB- bonds are currently on negative watch/outlook with at least one rating agency, and in danger of imminent "junking." So there you have it: for those who believe a recession is either imminent or will soon be priced in, keep shorting the BBB space. Meanwhile, those who think it will take some more time before the rating agencies filter out the noise, the best place to be short is those "pre-fallen" A bonds which will first become BBBs, before they too join the deluge into the junk space, some time around late 2019/early 2020.